Serving a succulent, mouthwatering Smoked Ham is a must when it comes to Easter. Get our Classic Easter Ham Feast to give your guests the feast they crave - with ease. 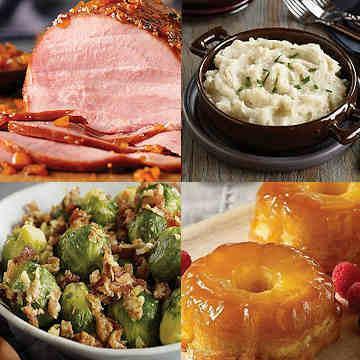 This favorites-filled collection features an oven-ready Boneless Smoked Ham, two easy-to-make sides, and indulgent Individual Pineapple Upside-Down Cakes for dessert. Bring home this time-saving feast today for a limited-time low price! Ingredients: Ham, Water, Salt, Brown Sugar, Cane Sugar, Contains 2% or less of: Sodium Phosphate, Vinegar, Honey Powder (Cane Sugar, Honey), Ascorbic Acid, Sodium Nitrite.